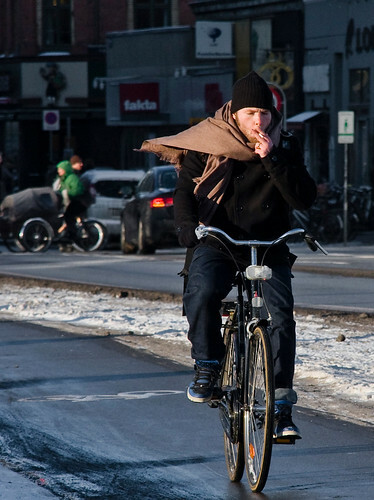 Whilst the Cycling Girl is - and has been - a cultural icon for more than a century, the gentlemen cyclists of Copenhagen are not to be forgotten. Funky hats feature prominently on these frigid days as much as they do on the heads of their female counterparts. This is a scene that baffles many a visitor to this city. Visitors from countries where the bicycle is considered little more than a sport or a recreational activity for persons interested in athletic pursuits. The bicycle is transport here. People in cars who smoke light up whilst commuting. Why should it be any different for commuters who choose other transport options? Or eating or drinking for that matter? Hardly surprising we have a number of posts about these things. And what a wicked cool scarf. 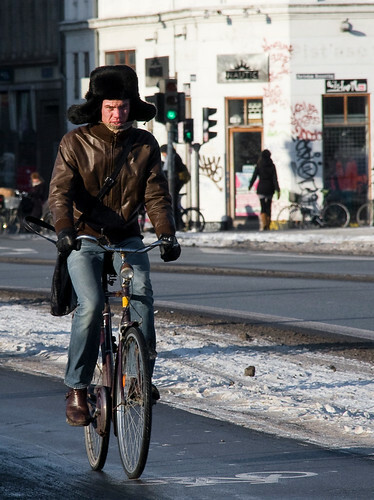 Bringing skiis with you on your bicycle these wintry days is probably a wise choice. I wear regular pants when cycling in Montreal winter cold, which is regularly worse than that in Copenhagen, i'm sure. either as a poster or in hi-res.? Are you sure this guy was Norwegian? Sounds rather implausible to me. Love the shot of the bicyclist hauling his skis. I just got a pair for Christmas and was thinking of skiing in and out of work on days when I can't bike. It's practically a straight shot from my front door and I think the idea stretches the notion of people powered transportation just a little bit further. Sorry, Norwegian girl, so probably she wasn't complimenting your legs. But wonders never cease. I've recently met a Norwegian woman that didn't ski(! ), so I guess your story isn't so implausible after all. any old pair of trousers will do. although in this current weather if i have to cycle about more than normal i'll wear some ski longjohns. if i remember to do it. 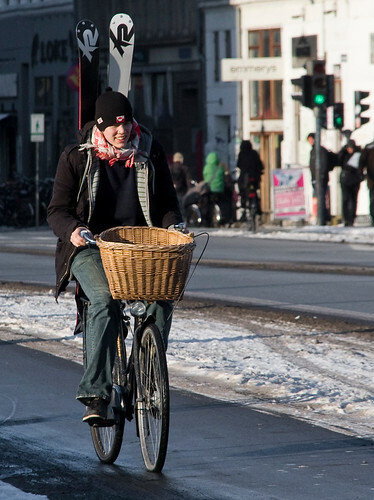 norway, in relation to bicycle culture, is still a bit behind. they are struggling with reestablishing the bicycle as transport and the sports freak label is strong. Thanks. I forgot I already asked you, so it seems I re-posted the question further up. Sorry. Have been browsing your Flickr-archives all weekend. Almost want to make me bike. Almost. That first hat... not good. Not good at all. Really needs to go. It's a great hat! I saw a chap wearing one here (in Scotland) on his bike and immediately coveted it. Sure, it looks a little mad, but who cares? I am the person with the skies... I had just picked up the skies at a friend. I was leaving the same afternoon to Valdisere.. Concerning jeans and winter, long underwear, or skiing socks, helps a lot.